Volleyball players blocking the ball after North tries to hit it over. 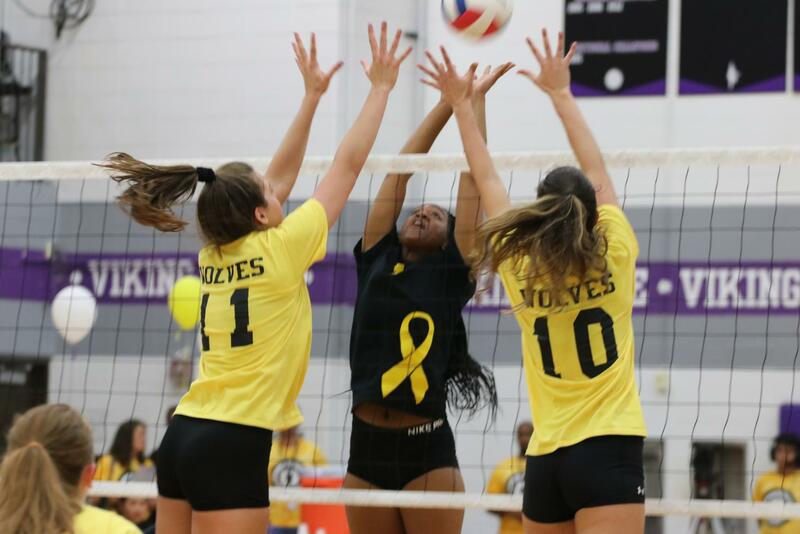 The Girls’ Varsity Volleyball team have, boasting a record of 18-8, are preparing for the last rivalry game of the season against Niles North. The girls have already defeated North in two straight sets on Sept. 17 at the Childhood Cancer Awareness game. There was an unbelievable turn out of fans to watch West take the victory. Two-year varsity player and junior Majla Spahija is excited to take on North one last time for the season. She’s confident that the team will be able to work together to win again. The wolves have been putting in a lot of hard work into prepping for this game. Captain Natalia Pehar has been out for the past few games due to a sprained ankle. It’s not guaranteed whether she will be in for the North game or not which will have a pretty big effect on the team, but younger sister and freshman Gianna Pehar is prepared for both circumstances. “As much as I do hope my sister is in the game, her health is more important. I wouldn’t want her injury to get worse if it isn’t 100% healed. If she ends up not being able to play, we’ll just have to play harder. If we play simple volleyball and make sure our blocks are there and the defense is ready to move then we can definitely succeed,” Gianna Pehar said. It’s most likely that Pehar’s ankle will not be healed in time for the North game. The news is devastating to Pehar since it’s her last year on the team, but she believes her team has what it takes to beat North without her. The last volleyball game against Niles North will be Oct. 9th, at 6 p.m in the contest gym at Niles West.